Top Gun – I feel the need for speed. There is an awful lot to see in the sunshine state of Arizona. Of course everyone has heard of the Grand Canyon, but have you visited the PIMA Air and Space Museum and have you seen the live reconstruction of that famous shoot out at the OK corral down Tombstone way? Only about 20 years separate the death of our last lawless cowboy Wyatt Earp in 1929 and the age of the B-29 Superfortress a four-engine propeller driven plane synonymous with dropping the first atomic bombs on Japan. Compared to the UK, America is a very young country, but they sure have packed a lot in the time they’ve had. I was wondering whether the PIMA air and space museum would be my kind of thing, but it really is an amazing place. Funded by the Arizona Aerospace Foundation it is the largest privately funded museum of its kind in the world and the third largest aviation museum in the US. It has over 80 acres of plane packed parking and even more exhibits inside five huge hangars. The museum displays more than 300 of the most significant aircraft in the history of commercial civil and military flight. It also operates exclusive tours of the adjacent US government’s and military’s only ‘Boneyard’ Air Force Base site which has another 4,000 planes just in case you haven’t seen enough next door! Will you be my wing man? One of the things that impressed me the most was the amount of volunteers who were ex pilots hanging around waiting to tell you all about the planes. Many of them had actually flown the planes there, and the stories they had to tell were pretty exciting. Our guide Gary, was telling the history of the aircraft from WWII and to be honest, I was quite spellbound by the true tales of derring-do. The Bell Iroquios UH-1N – nicknamed ‘HUEY’ helicopter from the Vietnam war which features in ‘Apocalypse Now’ and ‘Hamburger Hill’ is there with its sharks teeth painted on. 9,000 of them went out to Vietnam but only about 6,000 came back. There is a video running showing the famous scene from ‘Apocalypse Now’ blasting out ‘Ride of the Valkyries’ while the air grows thick with helicopters taking air cavalry into an assault on a Vietnamese village. I learnt how to identify how many missions the aircraft had been on and where it had shot down the enemy from the markings on the side. The Fairchild C-123B Provider was used for logistics and search and rescue for the US coastguard. This kind of aircraft was seen in the highly implausible Nicolas Cage film, ‘Con Air’. There were some old versions of Air Force One planes there – remember Harrison Ford as the high-jacked President in the tense thriller of the same name? This is a BIG baby! Just from an art and design point of view these planes are very cool things – with amazing ‘nose’ art and graphics which depicted women and cartoon characters which gave the aircraft individual personalities. Perhaps it was easier to trust your life to a plane if it was called Betty.. There are Mustangs and Angels and Blackbird spy planes. Hornets and Thunderchief fighters, Phantoms. Invaders, Liberators, Cougars and Tigers. This was a glamorous if dangerous world. 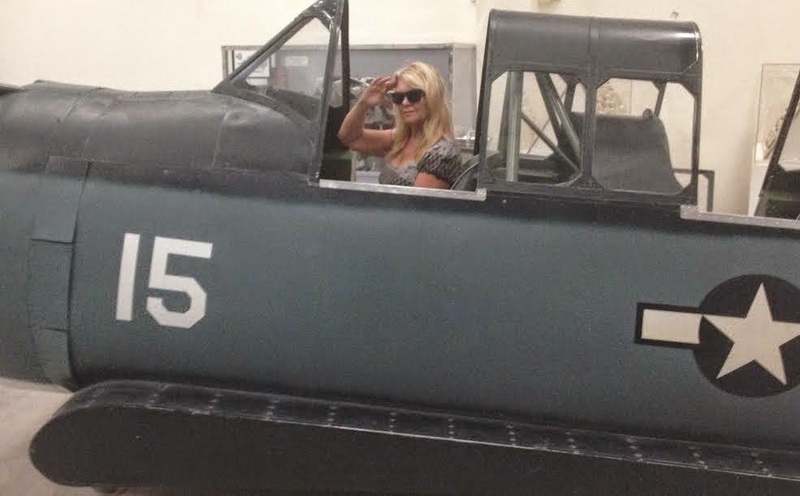 The PIMA Air and Space museum has art and excitement and stories and technology – its a plane awesome place to go if you are down Tucson way. I loved it and I think you would too. Next Post:The fight at the OK Corral in Tombstone – the town too tough to die!